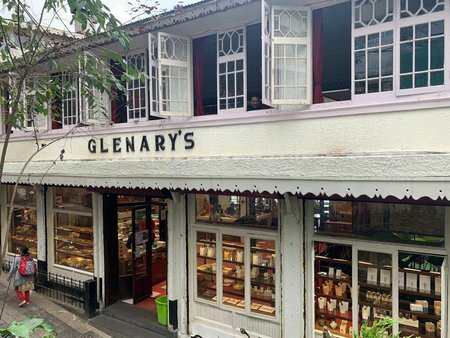 Glenary's Bakery & Cafe, also known as the Glenary's Cake Shop is located at the ground floor of a two storied white colonial building that prominently displays its name in front. This is a prominent landmark of Darjeeling and existing since the British colonial days. It's run by the Edwards family. Glenary's is located on Nehru Road and at a stones throw distance from the Mall (Chowrasta). The bakery & cafe is located at the ground floor). Glenary's Restaurant is located upstairs which you can access through a stairway inside the cafe or from outside the building. And at the basement is the Buzz Bar which is a modern pub. All three units belong to the Edwards family and the entire white building is known fondly in Darjeeling as The Glenary's. 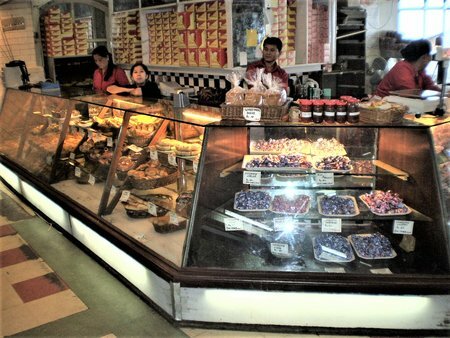 As you walk in through the huge wooden framed glass door into the bakery, you will see the cakes and snacks counter in front showcasing various types of cakes, pastries and snacks in a large glass case at the bakery counter. On the left and in front of the bakery counter is a nice lounge with sofas where you can relax and eat what you buy. You can of course get your food packed as well. Glenary's Bakery & Cafe is well known for the breakfast it serves. During breakfast, you get items like sandwiches, burgers, rolls, pies, pizzas, pastries, cakes and many other items including fresh bread and loafs. Then end your breakfast with some great Darjeeling tea or coffee. So what kind of snacks will you get here? 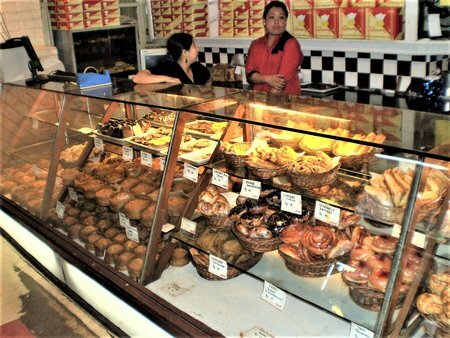 If you scan the glass case, you will see many different types of pastries, cakes including fruit cakes, muffins, croissant etc. You will also get items like Paneer Manhchurian (a dish prepared out of cottage cheese and in Chinese style), Chicken chili, sausage rolls (pork and chicken) etc. Then there are jam/lemon/chocolate tarts, chocolate brownies, loafs, burgers & buns, and different types of cakes and pastries. Glenary's has remained as the best bakery in Darjeeling district. They have an outlet at the lower town of Darjeeling at Chowk Bazaar (a much smaller one , but you will get most of the bakery items here which comes from the main shop). They also have a branch at Bagdogra (near the airport). Many restaurants and even hotels in Darjeeling buy the breads, cheese etc from Glenary's and serve them to their customers, such has been its reputation. 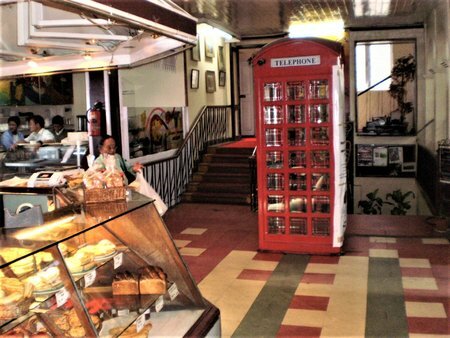 Right at the center of the room is a red colored old telephone booth that is symbolic of the early days. It adds to the grandeur of the cafe as a light music plays on all the time. You can see a red carpeted stairway next to the booth. That leads upstairs to the restaurant. 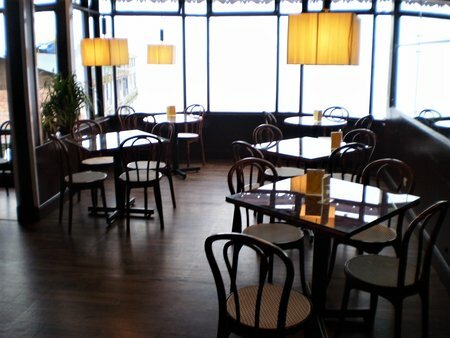 As you cross over the cakes and pastry counter, there is another wonderful seating area behind with several tables and chairs laid out. From here you can get marvelous views of the mountains and the valley while you have your breakfast or snacks. And now there is free wifi available at Glenary's. So if you have a laptop or your smart phone, it's good time to have a cup of Darjeeling tea, share your pictures with your friends or clear your emails. Internet Cafe at Glenary's: As you enter the Glenary's cafe, on your right there is a section for internet access. There are six PCs, some with flat screens and others with older models of monitors, all providing broadband internet connectivity. The rates are also quite reasonable and at par with other internet cafes in Darjeeling. For availing the internet cafe, it is not necessary to eat at Glenary's though. It is an independent section. Glenary's Bakery, Cake Shop & Cafe: 7am - 8:30pm. You get breakfast, snacks, cakes & pastries at the bakery & cafe. They accept credit cards. Glenary's is a partner of Darjeeling Tourism Card and offers attractive discounts to the card holders on its bakery products as well as in its restaurant and bar.